First off, I should say I’m not sure this is my favourite comic but I do think about it often. 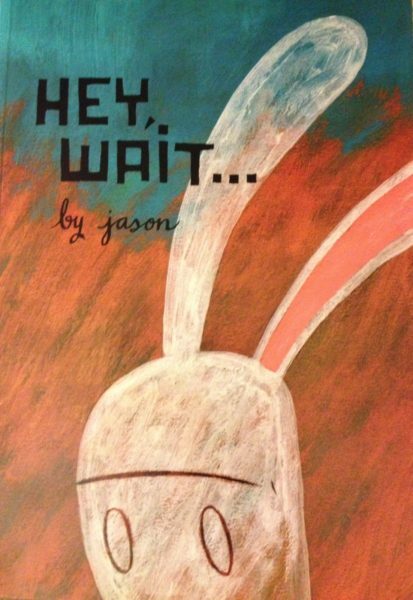 The book is “Hey, Wait…” by the Norwegian cartoonist Jason published by Fantagraphics Books. A slim black and white volume, “Hey, Wait…” is a story of sudden tragedy and how a life unfolds in it’s wake. Each character is anthropomorphised from an animal or zombie or monster. The world within the story is familiar with a few exceptions. Fathers travel to and from work on stilts instead of driving cars. Plus, children’s kites are at risk to ravenous pteranodons. The story begins with two lads who are best friends and depicts school days and summer days together. They talk about girls from school, draw comics and search the nearby woods for empty bottles. All seems well until a dare goes wrong and one boy dies. The story jumps in time to show vignettes of the survivor’s subsequent life. He has a mind-numbing factory job. He speaks by phone to his estranged wife and child. He meets someone new and pursues a relationship. It too fizzles. Another fracture in time shows drinking taking it’s toll to the point of unconsciousness. Later, the protagonist meets a cadaverous companion over coffee. He speaks to the fact that his life hasn’t turned out the way he imagined. His companion is silent. Next, in a sequence of small scenes, we see allusions to the childhood friend and his death before we are shown the protagonist board a bus and take a seat among cadaverous figures. This summary lacks the visual wit and sparseness conveyed by Jason’s drawings. It really should be read for full effect. 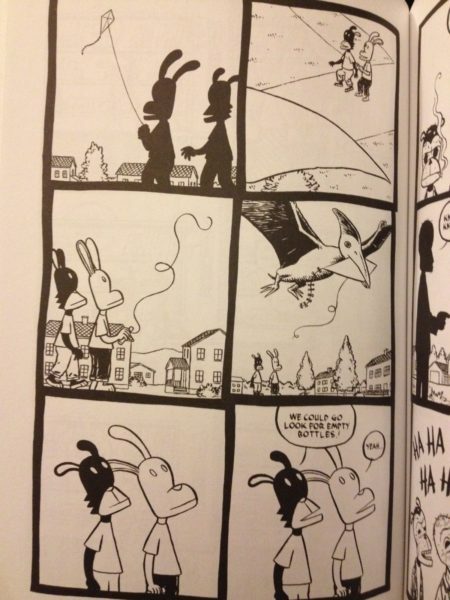 It is a story that conveys the magic and the tragic in life in a few pages of spare cartooning.